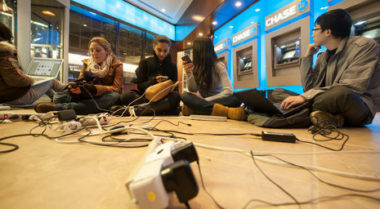 Hurricane Sandy left millions of Americans without power, which made it extremely difficult for them to get information and communicate with others as they deal with the devastating aftermath. Fortunately, social media proved to be a lifeline for those left powerless and helpless by serving as their main source of information and communication in the days after the storm. Social media crisis management saw enormous activity over the past week as people and government agencies rush to these platforms to reach out for updates, check in with family, and keep up with the progress on the road to the recovery. Monday night brought the storm to New York City and residents unable to get through the overwhelmed 911 phone lines, turned to Twitter to reach the New York Fire Department through their @fdny Twitter account. The social media platform proved to be a lifesaver by enabling them to send for help and get answers in a time of mass confusion. The New York Fire Department was only one of numerous government agencies using Twitter to provide vital information both during and after the storm. The New York Mayor’s Office and the Maryland Emergency Management Agency used Twitter’s promoted tweets to expand their reach to a broader audience in need. According to Yahoo! News, FEMA used its Twitter feed to tell people to rely on social media for updates on Hurricane Sandy and to stay in touch with family and friends, as well as to send out helpful tips for those unaccustomed to dealing with such storms. New York is the hub of an abundance of media and many major outlets suffered the effects of the storm. In fact, some media outlets were also forced to rely on Twitter when the floodwaters left their servers damaged and down. Of course, MDG Advertising also leveraged social media to serve the urgent needs of its client, Dental Care Alliance. MDG worked closely with DCA to insure they were able to keep their many patients across Maryland and Pennsylvania updated. As the storm approached, and in the days following the disaster, Facebook was used as a vital tool to keep patients informed . While nobody knows how much time or trouble will be involved in recovering from Hurricane Sandy, the only certainty is that social media will remain a vital source of crisis management and contact for millions dealing with the devastating aftermath. At MDG Advertising, a full-service South Florida advertising firm with offices in Boca Raton and New York, NY, our 360° marketing approach uses just the right mix of traditional and online media to reach your marketing goals. While some industries may fare better in print and others online, we strive to create a balanced approach where digital and traditional advertising efforts support each other and your marketing message is tailored to the medium. If you’d like to learn more about the power of Twitter and Facebook in social media crisis management, contact MDG Advertising. Read more at USA Today and Yahoo.com.